Government will tomorrow unveil a $60 million housing facility for civil servants as part of non-monetary incentives to its workers. Tomorrow’s event will see Government signing a Memorandum of Agreement with the National Building Society (NBS) on the roll out of the $60 million project. 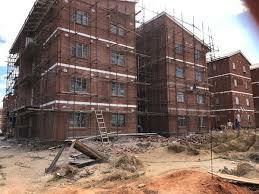 This is part of Government’s commitment to provide decent and affordable housing to the people, mostly civil servants. Inviting stakeholders to the signing ceremony, the Civil Service Commission yesterday said this was part of Government’s continued efforts to improve conditions of service for its employees. “The chairman Civil Service Commission will be signing a Memorandum of Agreement with the National Building Society on the roll out of a $60 million facility for public service housing project,” said the CSC. The signing ceremony will be attended by CSC commissioners, officials from the Ministries of Finance and Economic Development; Local Government, Public Works and National Housing; Public Service; Labour and Social Welfare and NBS. Although the project is open to civil servants, there are units that are available to non-civil servants. Government has over the years identified land in various cities and towns for residential stands and construction of high-rise apartment blocks for civil servants as part of non-monetary incentives for State workers. The development comes as Government yesterday engaged its workers over their salaries under the National Joint Negotiating Council (NJNC). Government maintained its $300 million offer for the workers and another meeting is scheduled for tomorrow. He blasted opposition elements who were hijacking civil servants’ labour issues to advance selfish interests.